The hand held VHF radio microphone system on a fixed frequency within the deregulated VHF band is an ideal solution for budget radio microphone requirements. 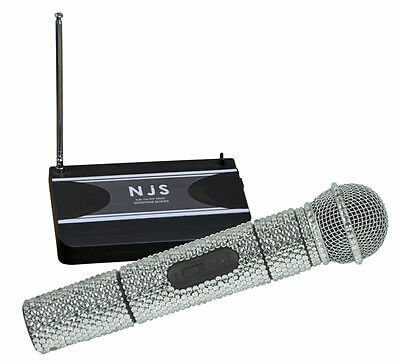 The microphone is covered in brilliant, sparkling silver coloured crystal effect stones for a dazzling look. Comes complete with transmitter, compact desk mounted mini receiver which can be powered by batteries or a PSU (not supplied) and a 3.5 mm connecting lead.